Compact grille with intelligent operation! The MicroCoil Grille requires nearly 50% less headroom compared to standard grilles on the market. It also operates quietly at speeds of 24 inches per second and requires no maintenance other than routine checks. Retrofit this closure into your parking application and stop letting headroom interfere with your designs. With many Roll Up Door and Overhead Garage Door options to meet your needs, we have all the solutions you need whether it's Fire Rated Doors, Insulated Garage Doors, or Steel Security Doors that are sure to inspire you. Our Architect Resource Center is here for your professional assistance when you need help with Roll Up Doors, Security Gates or any product in our line. Our tools include our Drawing Generator, Codes and Listings, Specification Generator, BIM Objects or custom design assistance with any upcoming project you have. All our downloadable documents all in one easy, quick to find place. Access all feature sheets, data sheets, specifications, BIM objects and more, all on one page. With our Architect Resource Center you get the tools and assistance you need. No matter if you need specifications for a roll up door, fire rated doors or safety gates and grilles, our specialized team is here to help. Get personalized design assistance with custom projects or access our many self-help tools including a drawing generator, specification generator, codes and listings and BIM object downloads. Need codes and listings or personalized help with your Roll Up Doors or Safety Gate? View our complete overhead door or security gate and grille selections, download all the codes and listings for our roll up product line, or you can contact our service or sales group for help on the fly. Whether your Fire Rated Door, Insulated Garage Door or any overhead door or grille is in need of parts, maintenance or service, our extensive worldwide dealer network is here to help keep your business rolling. Use our online directory to view our various accessories or find the right part, but no matter what you need, we are here to assist you. When you need an Overhead Door, our Roll Up Doors are custom manufactured to your design requirements. With various options, custom features and accessories, we can create the Roll Up Garage Door or Service Door that is uniquely yours. Security is a growing concern these days. Our Steel Security Doors and Security Gates and Grilles give you the added protection you need. Our Security Grilles and Metal Gates can keep your business safe from theft and burglary. While our Security Door Systems give your employees, customers and business added immediate security in the event of looting, vandalism or riots. With quick lockdown for immediate security and many designs, options and finishes available, our Maximum Security Door Systems can be both secure and look good. In the case of a fire, our Fire Rated Doors compartmentalize a fire event quickly. Our Fire Doors and Fire Shutters are installed where fires are most likely to occur to prevent fire and smoke from spreading. Roll Up Fire Doors and Fire Counter Doors can be connected to a Fire Door closing system for automatic protection. Insulated Garage Doors not only make buildings more energy efficient, but can also help seal buildings for protection from the elements, improve security and reduce sound transmission. 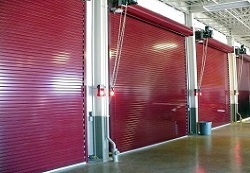 Our highest energy efficient Insulated Roll Up Doors decrease air infiltration by 94%. For Rapid Roll Up Doors and Grilles that provide worry-free maintenance, our High Performance Doors and Grilles are the ideal solutions. Crafted to not only provide higher roll up door speeds, but also to provide up to 1,000,000 maintenance-free cycles. Areas in need a of a High Traffic Security Gate or Low Maintenance Roll Up Door will appreciate the lowest lifetime cost and lead to increase productivity time. Our line of Counter Shutters are available in various options and designs. For areas that require smoke and fire barriers, rated Fire Shutters can be attached to an alarm-activated closing system. Our non-rated Roll Up Counter Shutters are available in multiple designs and styles, require minimal headroom and can be custom-fit into a wide variety of openings. Transform a room quickly with Accordion Walls and Partitions. Custom-designed side pocket walls provide additional privacy and security with minimal headroom and zero floor space. Sound absorbing Accordion Partitions give you additional privacy when needed. For quick access to the right information or personalized assistance for that unique project, visit our Architectural Resource Center and get the support you need for any application. Quick access to our drawing generator, specification generator, codes and listings, downloadable BIM objects and more. Our architect support team can help with any specification for our entire line of Roll Up Doors, Fire Rated Doors, Security Gates, Insulated Garage Doors or any of our products. If you don’t see what you need, we can even help you custom design a solution. We also provide Architect Continuing Education with AIA credits upon request. Looking for a new roll up door or security gate? Our product lines can meet a variety of needs.